I remember when I was a student describing them as napalm wrapped in crispy cardboard. If you eat it hot the pastry is crunch but the filling will burn the roof off your mouth. Wait for the filling to cool and you risk the pastry goes fatty on the bottom. Leave it to go cold and you risk the pastry going soft. The filling is a strange sort of texture free, pink material that has been waved past pork at some point in its creation. Now Sayers is a Liverpool institution founded a hundred years ago with 150 odd shops in the North West. When I arrived in Liverpool it was the dominant bakers across the city. If you needed something to eat and didn’t know of a better shop nearby you could at least guarantee a Sayers nearby and that the food would be just like every other Sayers. In any busy row of more than a dozen shops the odds would be on there being a Sayers. Often there would be two one toward each end of a row of shops. 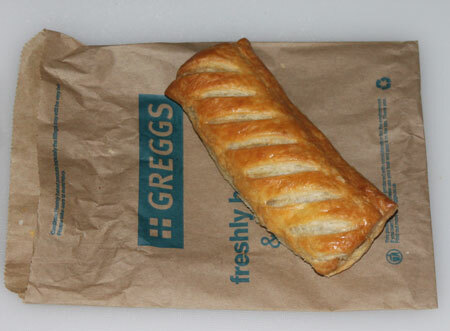 Greggs spread across the city as they’ve spread across the country. Sayers faced real competition: Greggs shops were more modern, the food a tiny bit more expensive, a tiny bit more modern and the food a tiny bit more exotic. It divided people: do you eat at Greggs or at Sayers? 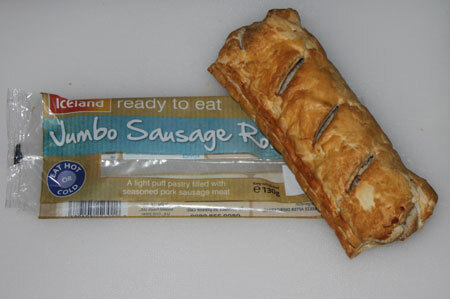 I’ve seen family groups go into both a Sayers and a Greggs to get sausage rolls. I did a quick survey of Sausage Roll availability at the shops near where I live. Well sort of the science bit. OK its completely unscientific. 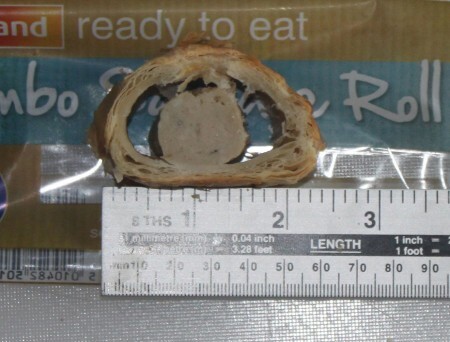 A sample of sausage rolls were bought from each seller for measurement, tasting and dissection. It was a dirty job but someone had to do it. 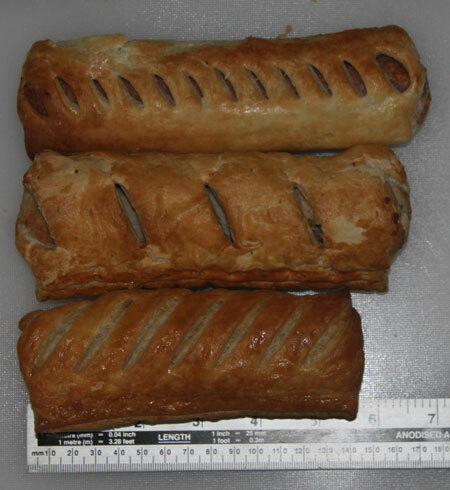 I tasted all three sausage rolls. 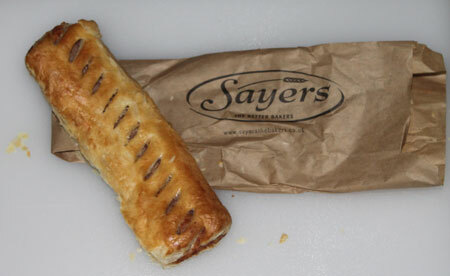 Its been some time since I’ve had a Sayers sausage roll: it seemed to me the filling has been improved. Less like a vaguely flavoured napalm mousse and more like lightly spiced sausage meat. 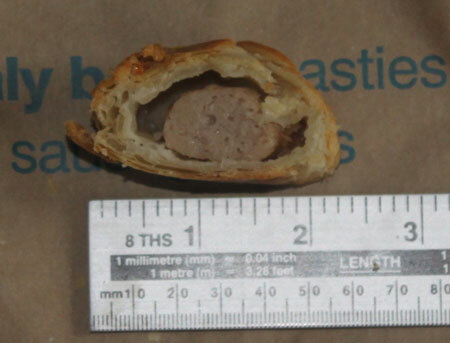 I couldn’t really say there was a significant difference between the Sayers and Greggs sausage rolls. The Iceland one had a spicier filling but was generally as palatable. The most noticeable difference was the pastry. The Sayers pastry was slightly crublier than the Greggs while the Iceland one had a more robust puff pastry possibly engineered to survive transportation better than the others. 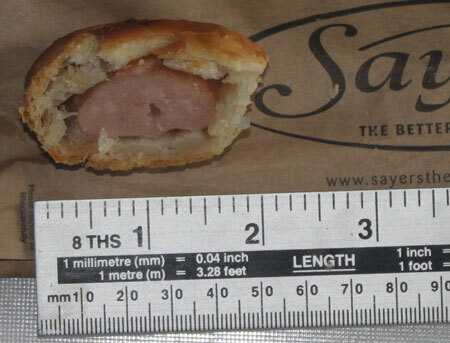 One Response to What is a Sayers Sausage Roll?